Buying into Heritage Vineyard Creek means a smaller and newer home. Downsizing your home and lifestyle can be just the ticket for the active adult. A profitable home sale, added to the resulting savings on household maintenance and utility costs in years to come, can substantially boost your financial security. And you may also gain a new sense of freedom by liberating yourself from all the "stuff" we tend to accumulate by retirement age. The question of whether to downsize is about your quality of life, however, and not just money. So, if it's going to involve a move far away, be sure to join with your partner in carefully considering the possible consequences -- emotional, social and physical -- of relocation. If your answer favors making the move, then consider these numbers. Even if the mortgage on your current house is paid off, taxes and upkeep can still cost you each year. Most annual property tax bills average about 1 percent of a home's value, according to the Tax Foundation. On top of that, annual maintenance bills average from one to three percent, per Freddie Mac. So, the carrying costs alone on a $500,000 home total about $15,000 a year. If you downsize and move into a $350,000 home - the figure drops to $10,500 (plus your monthly homeowner association fees). Another way of visualizing the savings – assume you only allow yourself a 4 percent annual rate of withdrawal from your retirement savings. In order to cover the taxes and upkeep on your current home, your retirement nest egg has to be $375,000. To cover the taxes and upkeep on a downsized home, a retirement nest egg of $262,500 will do. For the lower cost of living associated with downsizing, many retirees are drawn to the affordability of the Sacramento, California area, where home prices are an absolute bargain when compared to other California destinations like the Bay Area, suburban L.A., or San Diego. Enjoying a Mediterranean-like climate and located at the confluence of the Sacramento and American Rivers, midway between San Francisco Bay and the High Sierra, the Sacramento area has much to offer. Outdoors there's McKinley Park and its Rose Garden downtown, the American River Parkway hugging the riverbank for 23 miles, and golf courses everywhere. Historic sites include Sutter's Fort, the California State Capitol, the Folsom Powerhouse, Tower Bridge, Delta King riverboat. and the Old Sacramento Historic District. Sacramento cultural attractions include museums, galleries, and performing arts centers offering music concerts, ballet and opera. Theater venues include the Sacramento Convention Center Complex and the Wells Fargo Pavilion. The Sacramento Shakespeare Festival and the Sacramento Jazz Jubilee are annual events. Suncountry has long been a top choice for homebuyers seeking a peaceful community in the Sacramento area. This gated 55+ community has just 307 single-family homes which creates a strong sense of community. The homes are affordably priced, beginning in the low $200s, and offer between 980 and 1,500 square feet of living space. Residents of Suncountry keep busy with two on-site clubhouses. In the main clubhouse, residents enjoy the library, enjoy a game of billiards, play a game of table tennis, or meet up in the multi-purpose room. The second clubhouse provides an outdoor pool and an additional tennis court. More outdoor amenities include a tennis court, horseshoe pits, picnic area, and trails for walking and biking. There is also space available for RV parking. 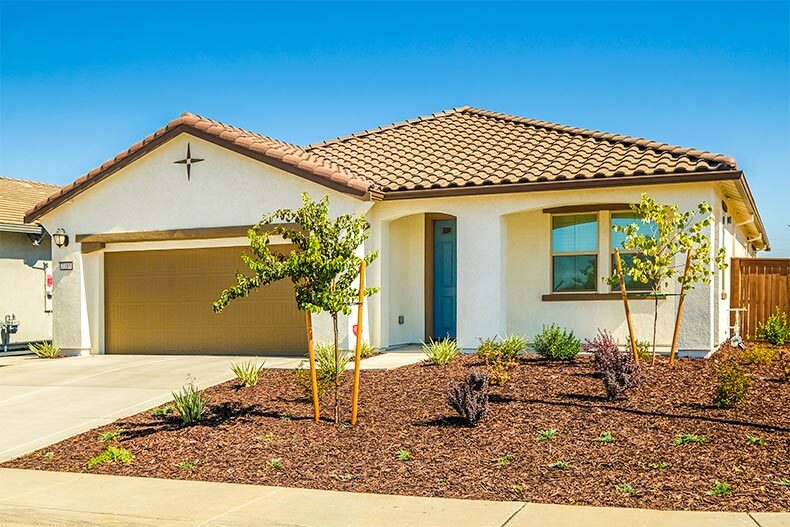 With just 177 homes, Destinations at Vineyard Point is for those interested in a small, affordable 55+ community in Sacramento. Development of this gated community was completed in 2015, which attracts buyers seeking modern floor plans and newer constructions. Some of the homes are even outfitted with solar electric systems. Located near Sacramento International Airport, Heritage Park maintains a strong sense of community while offering a vibrant lifestyle. This 55+ community has 965 homes in a gated environment. These residences include single-family and attached homes coming in two dozen floor plans. The community’s 25,000 square-foot clubhouse offers many ways to stay social and active. This clubhouse brings residents together with a fitness center, pub, hobby and game room, arts and crafts studio, library, and more. Outdoor amenities include a pool and spa, two lighted tennis courts, pickleball courts, horseshoe pits, and a volleyball court. There are also gardening plots available, as well as walking trails that wind through the community. Sun City Roseville allows residents to live an amenity-rich lifestyle while being tucked away between the Sierra Nevada foothills and the Sacramento Valley. This 55+ community consists of 3,110 single-family homes ranging from 878 to well over 2,000 square feet. The Timber Creek Recreation Lodge, at 52,000 square feet, offers a fitness center, indoor lap pool, hobby and craft rooms, and ballroom with a stage. Outdoors, residents can swim in the resort-style pool or play a game of golf at the 18-hole Timber Creek Golf Course. Heritage Vineyard Creek broke ground in 2017 and is ongoing, so homeowners can enjoy the many perks of being part of a new community. Buyers can select from popular upgrades – such as advanced solar systems, quartz countertops, and stainless steel appliances – at no extra cost. Upon completion, the development will have 171 single-family homes ranging from 1,743 to 2,206 square feet. An exclusive clubhouse called The Resort offers a fitness center, gathering area and activity room, a cozy fireplace, and a kitchenette. Outdoor amenities include a swimming pool and spa, lighted pickleball courts, community garden, and vineyard area.